Giving your treaters a fright: Priceless! Image courtesy of Micah Maziar on Flickr. Place a chair immediately outside (visible for all to see) with a stuffed costume (such as scarecrow, reaper, etc.). On the night of Halloween, place that costume on and sit in the same chair still and quiet with a bowl of candy. When a child comes up to get a piece of candy (because some people do just leave a dish out) either speak up or move to startle them. You’ll get screams, laughs, and a giggle or two yourself. Come to the door decked out in a costume that makes a statement. Example: Wear a butcher bib covered with fake blood, bloody plastic gloves, and greet the children with statements like “oh, good – I just finished off the last kids. Are you next? Let me get my tools,” but instead grab the bowl of treats. If you don’t have a coffin laying around, make your own from cardboard, pallets, foam board, etc. Place the coffin either standing near your doorway or laying down on the ground near your steps and pop out to hand out treats. If you happen to have a lot of leaves in your yard, this is a great way to play a prank on your visitors. Wear dark clothing/hat and tape(scrapbook dots or squares work well) a bunch of the leaves to your fabric to help you blend in. Bury yourself in the mound of leaves and wait for the trick or treaters to come and again, pop out to hand out candy. * Please understand some children are more impressionable than others and even adults. Someone told me a story about a parent peeing their pants right on their driveway when they were frightened. So let’s not be too frightening to anyone because this is suppose to be done with no harm intended. Luckily, about every other year or so we play a prank on our neighborhood kids. When we don’t, they seem a bit disappointed and ask where’s the live prop? The key to keeping them on their toes is not doing a prank every year. 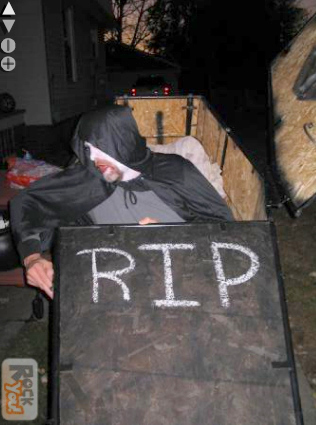 This entry was posted in Uncategorized and tagged DIY Coffin, DIY Grim Reaper, DIY Scarecrow, Halloween, IDEAS, pranks, Trick or Treaters by thewritegirlforthejob. Bookmark the permalink.